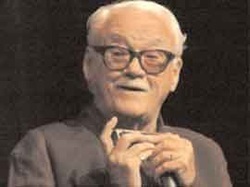 For Belgian guitarist/harmonicist Jean “Toots” Thielemans, English is, of course, a second language. So we can certainly understand and forgive an honest vocabulary lapse. That doesn’t mean we can't enjoy it, though.This story was told to me by my old and dear friend, Richard Lavsky, a composer of advertising jingles. For one of his jingles, Richard wanted a harmonica. His first choice to play it, needless to say, was Toots Thielemans. And, as luck would have it, Toots was in New York at the time, and Richard was able to book him. Which he did. Richard was a little surprised, though, when, one day before the scheduled session, Toots showed up in the studio. “Toots, the session is tomorrow!” Richard told him. “Hmm. Bushwhack it?” Richard asked him.